If you’ve ever wondered how utterly brilliant some of these game designers actually are, consider an average day in the life of a Sim. Wake up. Pee. Take a shower. Eat breakfast. Go to work. Come home. Eat dinner. Go to bed. Rinse, lather, and repeat. Millions of people have a blast playing this game, and using the toilet a major game feature! As far as I’m concerned, Will Wright is a god among men. In the Sims games, you customize and control the life of a Sim, a creature whose life and world very closely resembles our own. You must fulfill its basic needs, like sleep and hunger, and also more complex responsibilities and desires, like staying employed and falling in love. You start off with some basic character customization and goal selection. Those of you with the first Sims 3 also have the option of importing in your old characters. Once your Sim is to your liking, a short tutorial walks you through everything you need to keep your Sim happy, healthy, and eager to travel. For those of you who loved the obsessive control of The Sims 3, but felt like the world was just a little too small, you’re in luck. World Adventures is basically identical to The Sims 3, but it opens up a whole range of travel opportunities for those of an exploring nature. In addition to Sunset Valley, your Sims can go off and master new languages in China, explore ancient tombs in Egypt, or learn the subtle nuances of foreign cooking in France. These new locations are genuinely meaty additions to the original game. In addition to all the new Sims you can meet, there is a host of new shopping and food opportunities, with furniture and ingredients that can only be obtained by visiting certain locations. There is also a slew of new mini-games to distract and delight. These mini-games are what you must master in order to improve certain skills or prevent you from getting airsick on your travels. The fun factor of these mini-games can vary a bit, but they’re still a solid experience. The majority of the game is touch-based, with a few mini-games here and there relying on the accelerometer. Fans of Sims 3 may be disappointed to learn that there are no photos, and while gardening is in, fishing is out, and in general, earning money in the game is a little on the arduous side. Travel is great, but day-to-day life can get boring, and you have to stay pretty focused on your Sim’s goals to be successful. It’s certainly not reinventing the wheel, but with its sleek graphics and nice sound, The Sims 3 World Adventures is about as smooth and polished a simulation game as you can get. It’s only a small step up from the first one, but that still makes it an enormous step up from all the rest. If you already have The Sims 3, don’t expect any big changes, but if you’ve been waiting to see what all the fuss is about, Sims 3 World Adventure is the version you want. 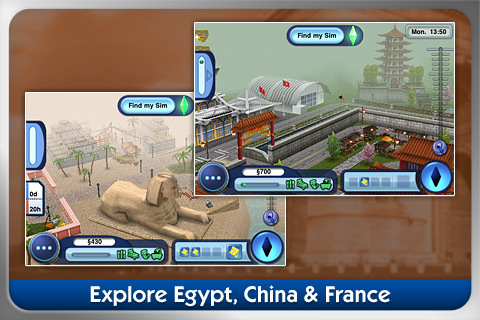 AppSafari review of The Sims 3 World Adventure was written by Tracy Yonemoto on April 13th, 2010 and categorized under Adventure, App Store, Featured, Fun, Games, Time Management. Page viewed 14418 times, 4 so far today. Need help on using these apps? Please read the Help Page. i am really dissapointed.. i payed for the sims 3 cheat on my iphone and the app cheats only work on your PC what is the point in this ????? When a Sim says get me a salmon and i’ll give you 100$, what do you have to do since you cant fish? Alas, the lack of fishing seems to have a lot of fans upset, since it was such a good source of income. If a Sim asks you for salmon in the game, that means they’re looking for a cooking ingredient. You can purchase regular ingredients at the market in town, but you can also buy exotic ingredients while on your travels. Hope that helps! I am liking the game so far…but I am lost on how to excavate the Pyramids…what does that game want you to do? Are you talking about the tomb exploration, Maddy? Usually the puzzles in there have to do with triggering some kind of pressure plate or finding something you can interact with, like a chest or a statue. Explore a bit and you’ll probably figure it out. It’s not bad so far. Really missing the fishing as well. One big problem is that I have only achieved 51 out of the 52 goals. I’ve been playing the game for 3 months now and there is no sign of the 52nd goal. Has anyone else had this problem? Would be good to get a list of the goals somewhere. How do you get a permotion? How the hell do you get married?? Please can someone tell me how the you flippen have kids. i mean i have found the whole WooHoo thing, but that doesn’t actually make you have a baby. and i have been reading other comments and it says sometimes that they have had a kid. PLEASE TELL ME HOW!!!!!!! When you travel someone asks if you want to go to a party. How do you go to the party?!?! When you travel someone asks if you wanna go to a party. How do you go to the party?!?!?! It’s a really good game, but if anybody knows any money cheats that do not involve jailbreaking, please let me know. I only earn 100 per day working at the museum and I can’t seem to get a promotion, so it takes weeks to save up for a holiday 🙁 but apart from that, it’s definately 5 stars. Some people are moaning about not being able to have babies like you can on Sims Ambitions… surely you can’t have a baby and then just leave her/him while you travel? Exactly. It is really easy to make more money in sims3 world adventure. Besides working monday to fri, my sim does gardening and sell the harvests to the market. Then after work she talks to the neighbors. Some neighboor asks for recipe you buy the recipe and give it to him and he pays you more than what you paid for it. One ask for french cheese and paid 200 for it. On fri after the last shift at work my sim pays for a 2 days visa to travel. My sim buys everything she need from these places. Every week end she has at least 2500 to 3000 coins to use while travelling. I hope this helps. I am also having problem with the ruin exploration. I cant seem to figure out how to do the symbol matching. please help. You’re soo cool! I do not believe I have read anything like this before. So good to discover somebody with a few genuine thkughts oon this subject matter. Really.. many thanks for stwrting this up.